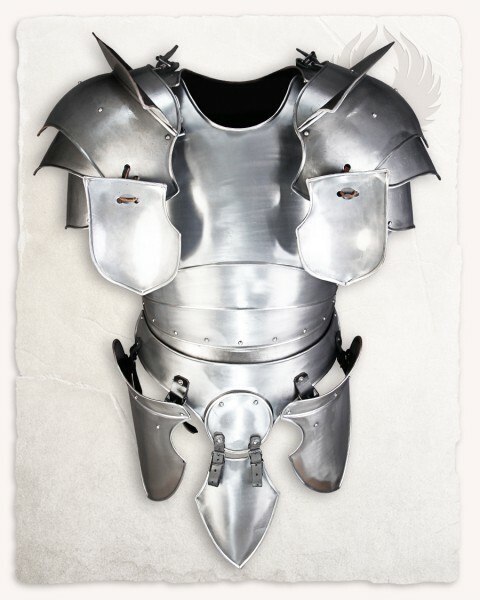 The plate armor came to Western Europe at the end of the 14th century and was used until the 17th century. It has been continuously developed and adapted to the respective needs of its carriers. So it is not surprising that there were a lot of variants of this armour.The "Galahad" plate armour is a three-quarter harness in fantastic design. Striking are the massive shoulders with the big blade crushers. With their large floating discs, they give the armor its impressive, powerful character. The torso is segmented and flexible. It is adjustable in size and passes into a armourbelt. Attached to this belt are the curved tassets. Between them sits a belt shield. "Galahad" is ideal for heavily equipped roles such as knights or paladins. The armour can be supplemented by arm and leg guards as well as with a chainmail.